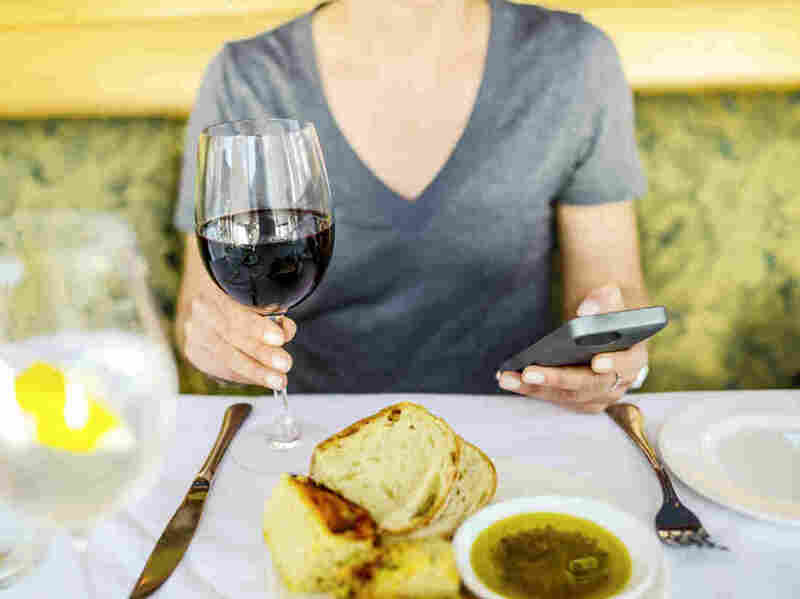 Your Waiter Wants You To Put Down Your Phone : The Salt All the things customers do on phones — texting, tweeting, taking pictures, fussing with Wi-Fi passwords — slows down the process of being seated, ordering and paying the bill. And it's annoying. You know how frustrating it is when you can't catch your waiter's eye? He may be thinking the same thing about you. Diners distracted by their phones have become a real pain in the restaurant business, interfering with the flow of transactions and generally slowing things down. "I would say probably 7 out of 10 people play with their phones throughout their meals," says Catherine Roberts, general manager of Hogs and Rocks, a ham and oyster bar in San Francisco's Mission District. "People are definitely on their phones excessively. It does gum things up." Last month, a post on Craigslist, nominally by a New York restaurateur, claimed that a comparison of surveillance tapes from a decade ago and today showed that people spent so much time with their phones — texting, taking pictures and complaining about Wi-Fi connections — that the average party took nearly an hour longer to finish its meals and pay the bill. The post went viral. NPR hasn't been able to establish its authenticity. And people in the restaurant business say it exaggerates the situation. But they are definitely discussing it. "iPhone-itis appreciably slows the progression of a meal," says Michael Whiteman, a restaurant consultant based in Brooklyn. "No one dares behave as if they have nothing urgent in the world outside their dining table, so it's all cellphones all the time." Everything just takes a couple of minutes more, says Roberts — helping customers type in passwords, or taking their pictures, "typically from several different angles." Restaurant staffers have different ways of handling these customers. "If somebody's on the phone, I don't go talk to them," says Rachel Rhodes, who manages Brenda's, a popular Creole-themed restaurant on the edge of San Francisco's downtown. "At least give me your order and then do whatever you want." Rhodes says that plenty of her customers are able to look up and make eye contact long enough to respond. Most of them genuinely care about the food and the experience they're having. But the fact that phones are omnipresent makes customers inattentive and slower to keep up their end of transactions. "There was a guest the other day who sat on her phone so long that her cocktail became warm," Roberts says. "She literally let it sit for 20 minutes and then demanded she have another one made for her for free." Even when customers put their phones down, they often leave them sitting on the table, daring servers to fry their electronics with a misplaced water glass. When customers get up, they often walk and text, bumping into staff or other patrons (or the occasional wall). It's also a problem when they first arrive at a restaurant. "People are staring at the phones much more as they walk in the door," says Brian Gavin, general manager of Absinthe, an upscale brasserie in San Francisco's Hayes Valley. That might just put a smidgen more burden on greeters and servers to reach out to customers. "I think they need a nice 'Hello, how are you,' and then they stop and then they start to address you," Gavin says. He says it's ultimately not that big a deal. Just as people soon got over shouting into their cellphones to show off they had them a dozen years ago, restaurants and their patrons will learn to work around the obsession with tapping at smartphones, and all the Google Glass-type iterations to come, through the polish and practice of interacting. Business reporter Alison Griswold argued recently in Slate that smartphones aren't that serious an issue for restaurants, that a minute here or a minute there eaten up snapping pictures is nothing compared with the upside of apps that allow easy payment, or lead customers to the restaurant in the first place. Even a skeptic like Roberts says that it's great having a reservation system that texts diners, who may not be visible at the bar or have walked outside, to alert them when their tables are ready. She recognizes that while smartphones may be annoying, they're certainly here to stay. And many servers get this, too. "People are always on their phones, but I wouldn't say it's a huge issue for us," says Kelly Anderson, who waits tables at Hallie's Diner in Petaluma, Calif., about 35 miles north of San Francisco. "It's part of how it is today and we just roll with it."